NEW YORK: New York City is committed to making sure the 12,000 phone booths still lining its sidewalks don't become relics. While the city announced plans to turn some of them into digital kiosks with SmartScreens in April, today it launched a pilot program to provide free public WiFi at public phone booths around the five boroughs. According to reports, the installion of the "military grade" antenna's that will be connected to each payphone, will be installed for free (average cost of installation is $2,000). 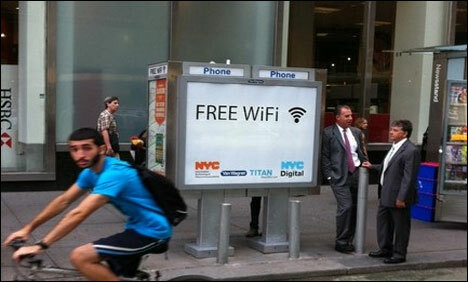 If successful, New York plans to add another 13,000 phone booths hotspots all across the city, blanketing the entire city with free internet access.